While the Hepburn Collection cannot project those qualities as fully as the iconic "Audrey" who inspired its name, we did think of her simple beauty when we set out to design this tasteful assortment of bathroom furniture. The 48 inch vanity is layered with a sumptuous Dark Chocolate finish upon the solid ash wood frame. Added premium materials like a sturdy matte gold base and hardware and soft-close glides and hinges. Match the vanity with the complementary mirror and linen tower, and Hepburn is guaranteed to delight for years to come. Inspired by mid-century modern console design, the Coventry Collection from Avanity features solid teak construction with minimal ornamentation. The 48 inch gray teak Coventry features soft-close doors, sturdy and stylish splayed legs, and an abundance of storage space. Teak is the perfect material for bathroom furniture, as it is both durable and water resistant. With Coventry form follows function with superb simplicity. Hepburn 48 inch Vanity Only in Dark Chocolate While the Hepburn Collection cannot project those qualities as fully as the iconic "Audrey" who inspired its name, we did think of her simple beauty when we set out to design this tasteful assortment of bathroom furniture. 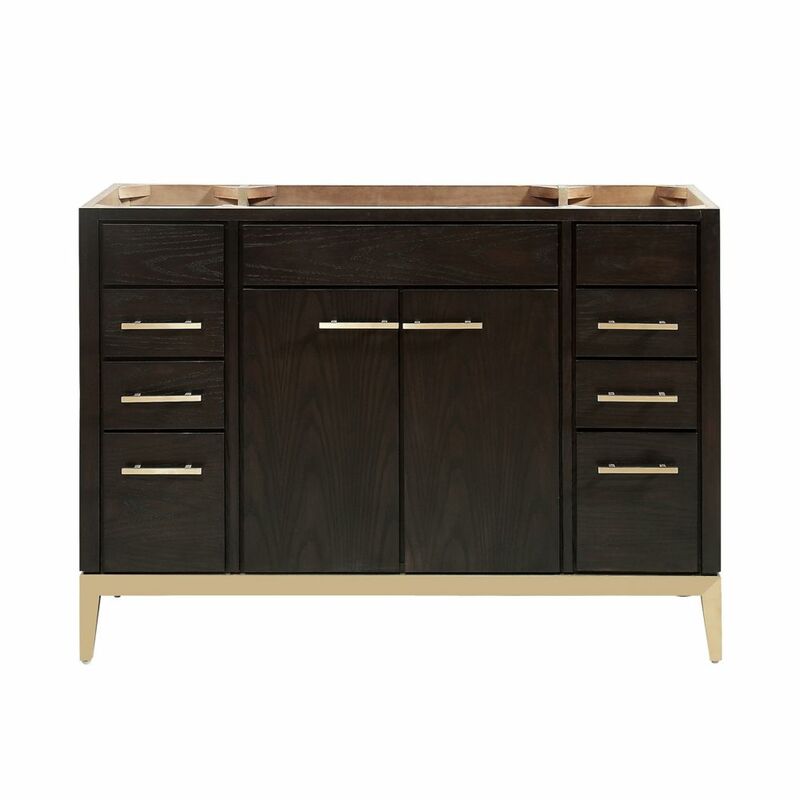 The 48 inch vanity is layered with a sumptuous Dark Chocolate finish upon the solid ash wood frame. Added premium materials like a sturdy matte gold base and hardware and soft-close glides and hinges. Match the vanity with the complementary mirror and linen tower, and Hepburn is guaranteed to delight for years to come.